The use of only two narrow wave bands of light (blue and green) during an endoscopic examination, so as to make blood vessels and other tissues in the mucosa more visible. Blood vessels become more visible under narrow-band illumination because both of the wave bands are easily absorbed by hemoglobin in the blood. In addition, the blue and green wave bands in narrow-band illumination each penetrate the tissue to differing degrees, so that blood vessels near the mucosal surface appear as a different color from blood vessels deeper in the tissue. In the field of laryngology, narrow-band illumination can help an examining clinician to identify the vascular changes that characterize a range of disorders, including recurrent respiratory papillomatosis, capillary ectasia, glottic sulcus, ulcerative laryngitis, and others. It can also help to identify subtle, hazy leukoplakia. The technology, developed by Olympus, is officially called Narrow Band Imaging™. KayPentax offers a different, software-based method for highlighting vascularity and other tissue characteristics, which is called iScan™. Close view of abducted cords, standard light. Same view, but under narrow-band light. Note how the blood vessels are much easier to see. In addition, the right vocal cord (left of image) manifests a small, whitish area of submucosal fibrosis (not true leukoplakia). With standard light, the leukoplakia on the right vocal cord (left of image) is visible but indistinct, as a hazy, whitish patch. With narrow-band light, not only the network of blood vessels but also the hazy leukoplakia is much more apparent. Diffuse leukoplakia on both vocal cords, as seen under standard light. Closer view, using narrow-band illumination. The leukoplakia is accentuated, but punctate vascular markings are also accentuated. We sometimes call this “HPV effect,” though in fact this man’s HPV subtyping was negative. 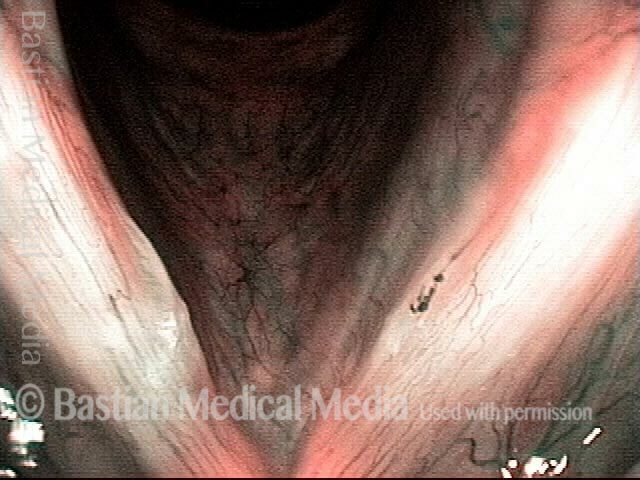 Standard light reveals dilated capillaries, especially on the left vocal cord (right of image), as well as bilateral vocal nodules. Narrow-band light makes the dilated capillaries stand out more clearly. Standard light reveals a faint stippled vascularity and a general mild inflammatory response (pinkness), indicative of HPV infection. Patients like this are often misdiagnosed with acid reflux. Narrow-band light makes the stippled vascularity of this patient's HPV-induced lesions much more apparent. Under standard light, the candida colonies on this patient's vocal cords (best seen on the right cord, which is left of image) appear vague and hazy. Under narrow-band light, the candida colonies (as well as the vocal cords' vascularity) are much easier to see.